It's my pleasure to share with you how I make mangosteen clay miniature. Mangosteen is widely known as the queen of tropical fruits. Polymer clay or air dry clay (ADC) in white, black, red, brown and green color. I use air dry clay for this tutorial. I would suggest you to check my "what clay to buy" page for more information if you are not sure. First of all, choose the color you like for the skin or rind. I mixed brown clay with a little bit of red and green color. Don't worry to much about it because you can always paint it later on. Condition the clay and then make several tiny ball shape about 1 cm in diameter or to any size you like. Poke the top part of the ball shape with tooth pick or your clay pin tool. Let them dry. 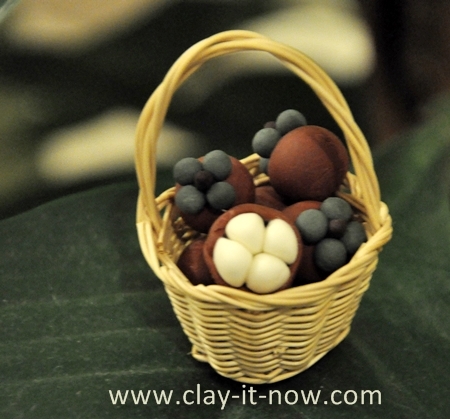 Take your green color clay, roll them to tiny ball shape and flatten it with your index finger. Prepare four of these for each fruit. Roll brown clay to short and tiny sausage shape for the stem. Attach the stem to the hole with white glue and then the 4 green flat shape around the stem. If you want to use this mangosteen for jewelry bead, insert your jewelry pin before the clay dry. Paint the skin with acrylic paint if you are not too happy with the clay color and coat it with varnish to protect the clay. To make cut fruit, roll white clay to ball shape and then cut the ball to 4 equal size or 5 unequal size to make it look more natural. Use your finger to smooth the shape of the fruit/ flesh. For the rind, take the fruit skin color clay, roll it to sausage shape to about 2 cm length and diameter of 0.5 cm. Flatten the sausage shape with your rolling pin and wrap it around the flesh and tidy up the bottom part to make it half fruit shape. That's it. So, you have two types of mangosteen clay miniature, the whole fruit and the cut fruit.